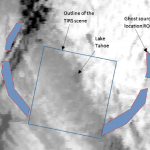 A TIRS (band 11) image over Los Angeles and the Pacific Ocean showing significant “banding.” Image credit: Montanaro et al. 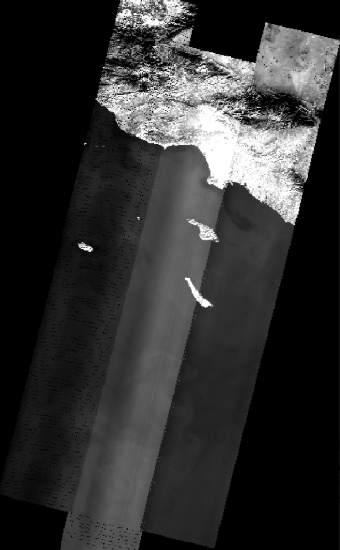 Oct 31, 2014 • Shortly after the launch of Landsat 8, the calibration team noticed something strange: bright and dark stripes, or “banding” was showing up across certain images collected by the satellite’s Thermal Infrared Sensor (TIRS). Prelaunch testing of the sensor had indicated that highly accurate measurements (within 1 Kelvin) with little “noise” could be expected—what was going on? Then, when Landsat 8 collected data as it under flew its predecessor, Landsat 7, en route to its home orbit, thermal measurements of the same region of Earth taken at the same time by the two satellites—which should have been the same—showed several degrees of error. To solve this mystery, the Landsat calibration scientists, or cal team, had to look for clues. Matthew Montanaro and Aaron Gerace, two thermal imaging experts from Rochester Institute of Technology’s Center for Imaging Science and members of the cal team, were on the job. As part of the standard post-launch commissioning, radiance measurements made by the TIRS instrument were compared to ground-based measurements made from lake-based buoys. This process of comparing satellite measurements to “ground truth” is called absolute calibration. The absolute calibration verified that there were significant errors for certain scenes that were severe enough to violate Landsat’s rigorous quality requirements. Oddly, while errors were detected in TIRS’ thermal measurements of the ground, internal calibration measurements (measurements of an onboard light source called a “blackbody”) were good. In fact, looking at just the onboard calibration, TIRS was exceeding its performance requirements for both noise and stability. “The calibration results from the onboard blackbody indicate that the instrument is extremely stable. The absolute calibration data was giving us comparatively huge errors; that doesn’t square with an instrument that looks to be rock solid,” calibration scientist and cal team member Julia Barsi explains. This discrepancy told the cal team that when the telescope was looking at a uniform source of energy that filled the telescope’s field-of-view, the problem disappeared. The center SCA overlaps with portions of the right and left SCAs. In the places of overlap, coincident measurements of the same ground location are made—and should measure the same radiance. But in some cases their measurements drift apart causing that “banding” that first alerted the cal team to a problem. The cal team ran tests to make sure the environmental conditions aboard the satellite were stable and that varying temperatures on the focal plane were not causing the problem. 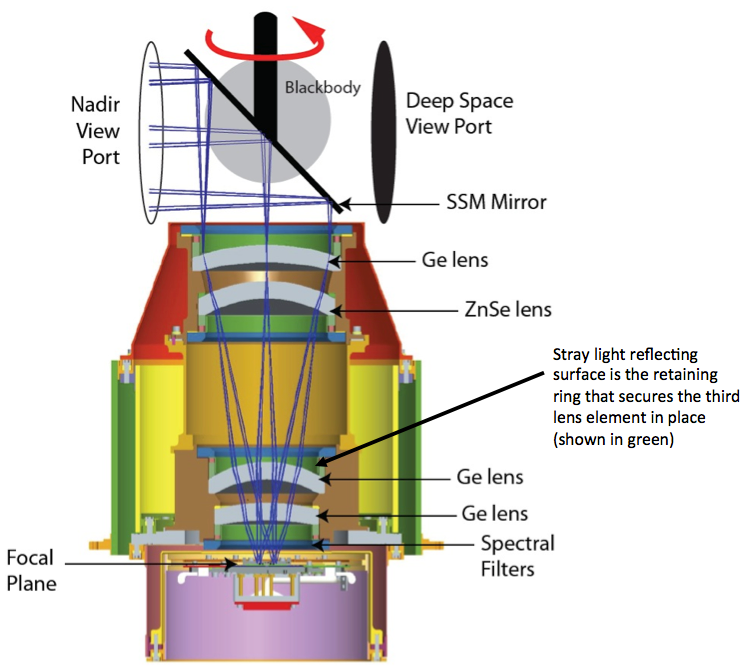 The focal plane needs to be uniformly cooled to less than 40 K (-388º F), while the telescope optics need to operate at 186 K (-125º F). Conditions proved stable indicating that the instrument’s operating environment was not the problem and that the errors were not being caused by any internal instability. In scenes that showed both desert and sea, it was noticed that the SCA overlap differences seemed to loosely correlate with the transition from hot land to cool sea, and these differences appeared to vary with season—they were worse in the summer. Also, the TIRS image radiance was always higher than “ground truth” measurements. 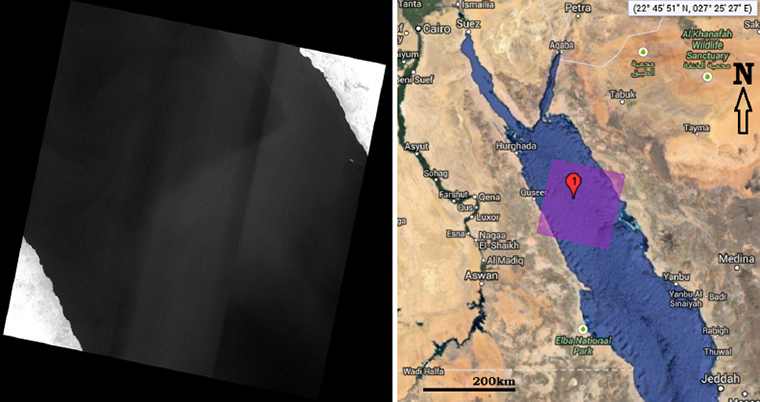 A TIRS (band 11) image of a scene over the Red Sea (left) and a context map from USGS Earth Explorer (right). 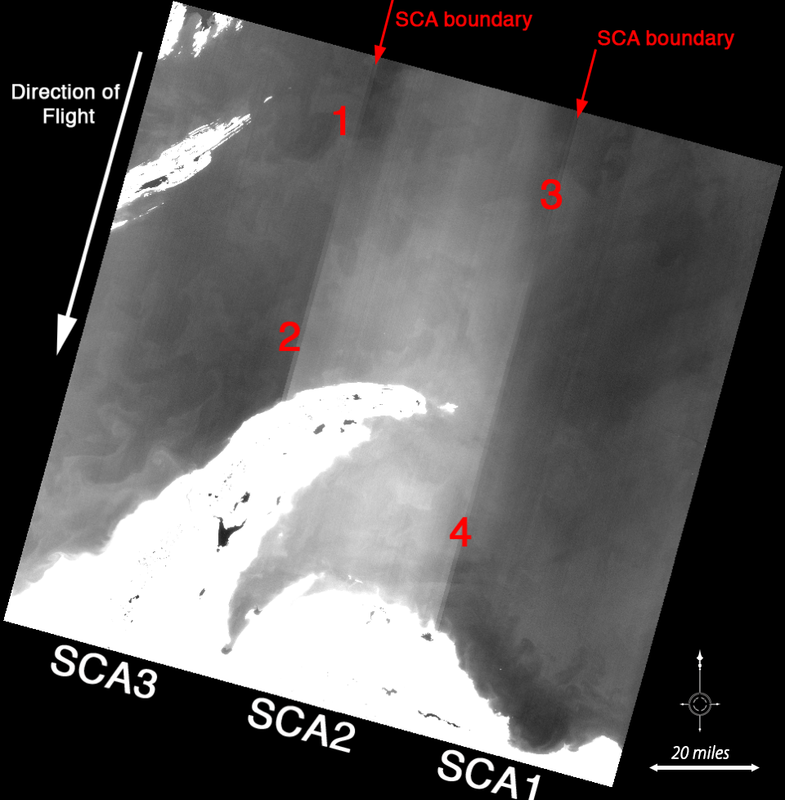 The image data from the three SCA focal plane arrays is evident due to banding in the across track direction. Image credit: Montanaro, et al., 2014a. Given all of these clues, the instrument team started to suspect that radiance from outside of the scene might be scattering into the telescope’s field-of-view, making some radiance measurements higher than they should be. This would also explain why the errors were varying—energy from varying places was hitting the detectors as the satellite collected data along its path. And it would explain why the errors were worse in the summer, when the surrounding land and water were warmer. To test this stray light theory,a bright, concentrated light target was needed, one surrounded by darkness that could be imaged to see if any energy from outside the telescope’s field-of-view showed up in the data before the telescope set its sights on the target. A signal from an out-of-field source, or a “ghost signal,” could be found this way. The moon held the answer. The moon, a bright object surrounded by darkness, was the perfect target. Landsat 8 looks to the moon each month as part of its calibration process. 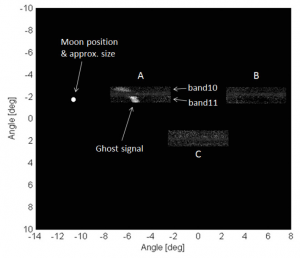 Lunar scan data confirmed that light from the moon was showing up in the data before the moon was in the telescope’s field-of-view. The cal team had found a ghost. The lunar scans had confirmed that stray light (i.e., the “ghost signal”) was causing the errors they were seeing. “The error in bias was a direct result of the stray light, since more radiance was getting to the focal plane than should be.” Barsi explains. The ghost signal has added as much as 8 K to data readings for the second TIRS thermal band, or band 11. Band 11 errors are typically double those of TIRS’ first thermal band, band 10. The Landsat 8 flight operations team performed a series of special lunar scans that mapped out the position of the moon throughout the out-of-field area of TIRS. 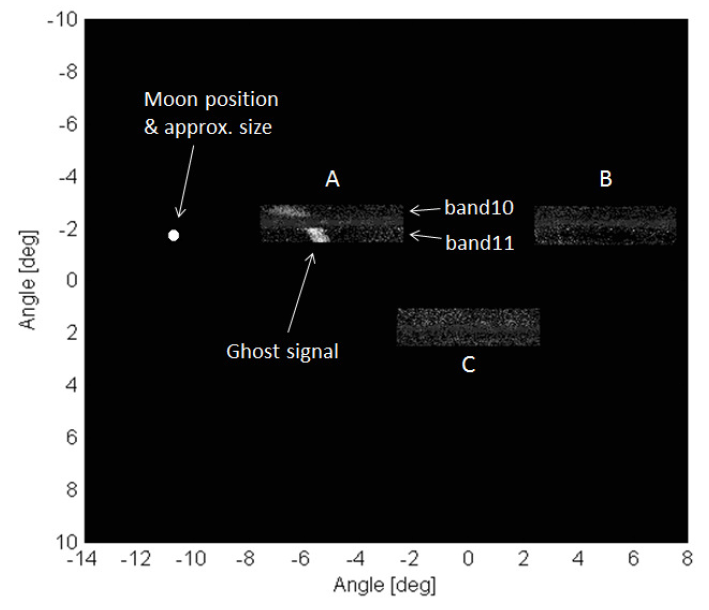 The TIRS optics team (the team that built the instrument) then used these lunar scan data to produce reverse ray traces to find the surface within the TIRS instrument that was causing the out-of-field reflections as well as the source regions “on the ground” that the errant surface was reflecting. 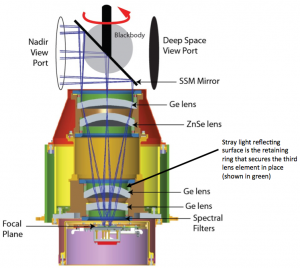 A retaining ring for the third TIRS lens was found to be the errant reflective surface in the instrument. This piece of hardware that keeps the third TIRS lens in place was also reflecting unwanted energy onto the focal plane. The ghost-maker had been found. 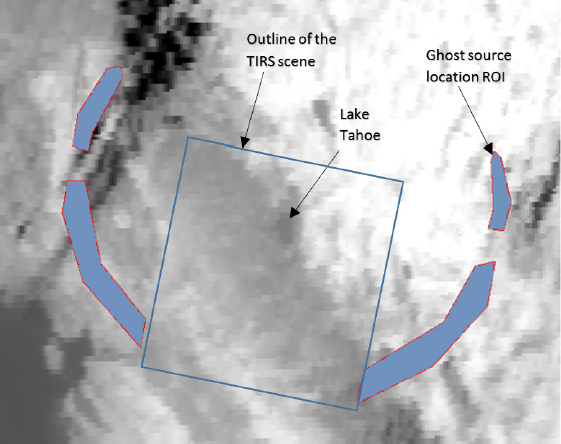 Getting rid of the TIRS ghost to fix the data is no small undertaking. 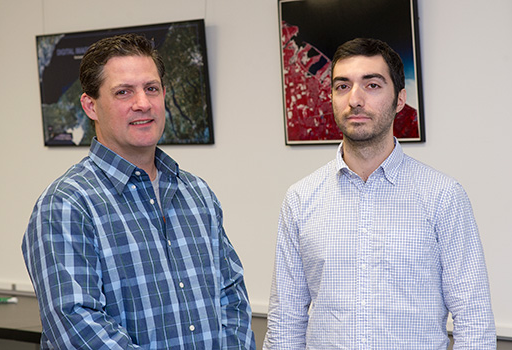 After the discovery of where on the ground the extra signal is coming from, Gerace and Montanaro set out to develop a way to calculate what the contribution of that extra signal is, and then subtract that from the TIRS measurements to get the accurate answer. And these calculations need to be made for each TIRS detector—all 2000 of them for all 700+ scenes per day. It’s good to have a crack cal team. The cal team is now working on will be tested this winter and spring. Once the team is satisfied with their results, the methodology will be implemented by USGS into their Landsat 8 ground processing system. Once the cal team delivers the solution, the implementation process will take about a year to implement. For now, USGS advises to only use TIRS band 10 for thermal measurements. 2017 Update: The stray light correction developed by Montanaro and Gerace has been operationally implemented into the USGS Landsat data processing system as of March 2017, for details see USGS webpage about the Landsat Collection 1 Data Set.